There is nothing nice than to cruise the Seine whilst enjoying a glass of champagne gazing at the Eiffel Tower as you glide by. And for those who want to skip the line to go up the Eiffel Tower what can be better than combining them both. 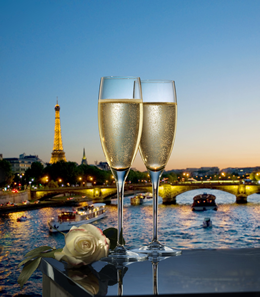 The one hour Champagne Cruise with Eiffel Tower ticket is an excellent option for anyone who wants to enjoy an exclusive evening experience combining the best of what Paris is known for. You will glide for one hour with your guide answering any questions you may have on what you see before you are escorted to fast track entry on the Eiffel Tower. Do note summit access is not included in this experience – tickets to the summit can be purchased on the second floor.